Click on the links below to jump directly to that section, or scroll down to take a look at everything. Per my online article and YouTube video, both titled "Agave Snout Weevil Prevention and Treatment," experts recommend a systemic insecticide that contains Imidacloprid, such as Compare N Save Systemic Tree & Shrub Insect Drench. This is a "green" alternative to powders containing pyrethrum. Comprised of crushed fossilized diatoms (fresh-water algae), diatomaceous earth is soft to the touch for humans, but scratches and penetrates insect exoskeletons, dehydrating them. It must remain dry to be effective. Try Safer brand Diatomaceous Earth. See my article: "Ants in Your Succulents? What to Do." Sprinkle this powder from Preen on the ground wherever you don't want weeds. It stops their seeds from germinating. As a garden chemical, it's safer than most, much safer than Round-Up (which you won't need if you use this). Spread it in late fall or early winter, before weeds germinate. It should be watered-in, so right before a rainstorm is ideal. Bare dirt+sunlight+water=weeds, so distribute it on exposed ground, especially where weeds grew previously. Be sure to spread under spiky agaves and cacti so you don't have to weed around them come spring! A hose-end trigger sprayer ensures water goes where you want it and isn't wasted. Gilmore's Thumb Control Hose Nozzle is a terrific sprayer with easily adjustable apertures, from mist to narrow blast. Every time I use it, I marvel at its design and usefulness. Around $16. 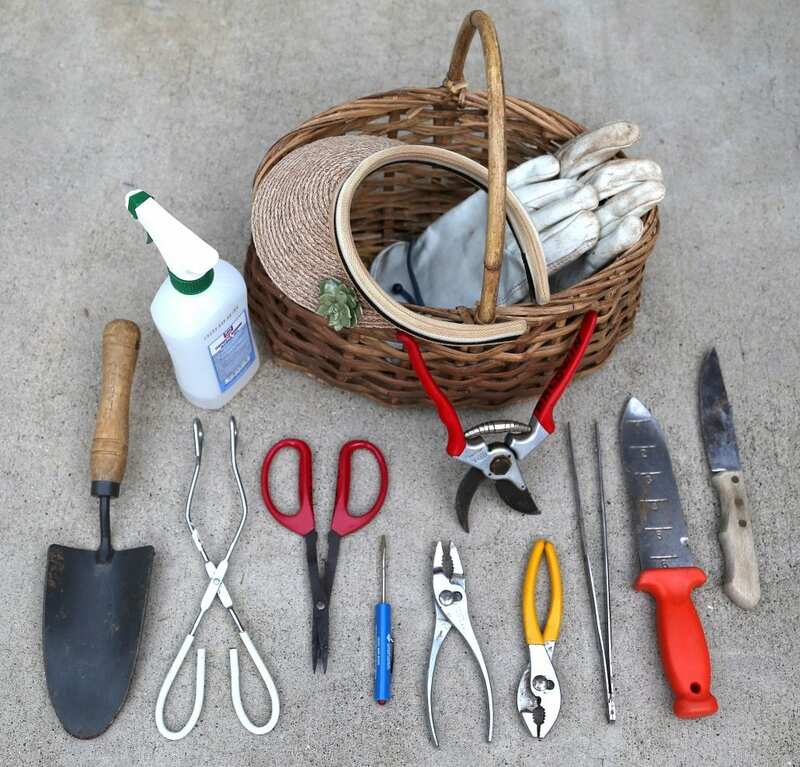 My garden tools include a trowel, tongs for grasping cactus, 70% alcohol for spraying aphids and mealies, clippers for fine pruning, a small screwdriver for adjusting irrigation sprayers, a sun visor, leather gloves, Felco pruners, two pairs of pliers (one for holding a riser, the other for unscrewing the head), long tweezers for reaching where my fingers can't, a soil knife for cutting roots, and a serrated kitchen knife for sawing through soft limbs (such as those of yuccas). I use pieces of window screen (sold by the roll for around $8.50) to keep soil from falling through the drain holes of pots. You also can use drywall tape, but I prefer the finer mesh of window screen because it keeps pests (like ants) from entering the soil through the drain hole. I know it's overkill to buy a roll of screen for a single pot, but really, you should be using it in ALL your pots. Share the surplus with gardening friends. It cuts easily with scissors. I prefer rubber string (a soft, flexible coated wire product) to rope, stretchy green tape or wire for tying branches and training plants. It's tough but bendable, easy to secure (simply twist) and easy on the hands...and eyes. The color blends right in. About $15 for 16 feet. No-splash watering can has a narrow spout that puts water where you want it - at the plant's base, not on its leaves. Wet foliage doesn't harm succulents, but when drops dry, they can leave white rings from mineral deposits. I keep a good-looking watering can near my potted plants. This one is only about $15. Kevlar sleeves are a must when gardening in close proximity to spiny plants, such as cacti or agaves. These cut-resistant tubes protect your arms, are made of stretch fabric, and have a thumb slot. Around $8 per sleeve (sold singly; order two). Annually in your garden right before a winter rainstorm, spread Ironite according to package directions. In spring, as succulents awaken from dormancy, apply a balanced granular fertilizer. March or April is also the best time to feed container-grown succulents; I give mine Moo Poo Tea, a tea made from composted, dehydrated cow manure. In my YouTube video, "Drill Holes in Nondraining Containers," the power drill is a DEWALT DW246 7.8 Amp 1/2-Inch Drill with Keyless Chuck, around $150 on Amazon. The diamond drill bit ("1/2 inch Diamond Tipped Hole Saw Drill Bit for Ceramic Tile Glass") came from Home Depot, but it's also available on Amazon for around $4.50. When it comes to garden plants, cacti are anything but standard issue. The bulk of home gardens contain exactly zero species of cactus, and the thought of growing them makes gardeners think, “Ouch!” In The Gardener’s Guide to Cactus: The 100 Best Paddles, Barrels, Columns, and Globes, Scott Calhoun is out to change that perception, and bring the beauty and ease of cactus home. It’s high time that cacti took their place alongside the trendy succulent. Cacti & Succulents for Cold Climates: There are many reasons to grow cacti and other succulents—they're drought-tolerant, low-maintenance, and they look great. But what about hardiness? For those who thought that these spectacular plants were only for gardens in California and the Southwest, guess again—hundreds are fully cold-hardy and can be grown outdoors from New England to British Columbia, Wisconsin to Texas. Ruth Bancroft is a dry gardening pioneer. Her lifelong love of plants led to the creation of one of the most acclaimed public gardens, The Ruth Bancroft Garden in Walnut Creek, California. The Bold Dry Garden offers unparalleled access to the garden and the extraordinary woman responsible for it. In its stunningly photographed pages, you’ll discover the history of the garden and the design principles and plant palette that make it unique. Packed with growing and maintenance tips, profiles of signature plants for a dry garden, and innovative design techniques, The Bold Dry Garden has everything you need to create a garden that is lush, waterwise, and welcoming. Gardeners and garden designers are having a love affair with agaves. It's easy to see why—they're low maintenance, drought-tolerant, and strikingly sculptural, with an astounding range of form and color. Many species are strikingly variegated, and some have contrasting ornamental spines on the edges of their leaves. Fabulous for container gardening or in-the-ground culture, they combine versatility with easy growability. In Agaves, plant expert Greg Starr profiles 75 species, with additional cultivars and hybrids, best suited to gardens and landscapes. In recent years California has been facing extreme drought, and in 2015 they passed state-wide water restrictions that affect homeowners. Unfortunately, the drought is only going to get worse, and gardeners who aren’t willing to abandon their beloved pastime entirely are going to have to learn how to garden with the absolute minimum of water. The Drought-Defying California Garden highlights the best 230 plants to grow, shares advice on how to get them established, and offers tips on how to maintain them with the minimum amount of water. All of the plants are native to California—making them uniquely adept at managing the harsh climate—and include perennials, annuals, shrubs, trees, and succulents. In The Timber Press Guide to Succulent Plants of the World by Fred Dortort, the plants are organized into 28 intuitively logical groups, such as succulent euphorbias, mesembryanthemums, bulbs, succulent trees, aloes, agaves, and haworthias. Each entry includes information on the plant's native habitat, its cultivation requirements, and its horticultural potential. As useful to novice growers as to collectors and those with an existing interest in succulents, this will be the standard reference for years to come. For covering plants during brief frosts, use DeWitt's “winterization cloth freeze blanket, Agribon's floating row cover; Pellon nonwoven fabric; or simply use old bedsheets. If temps drop into the 20s, consider a Walk-In Greenhouse that can be dismantled and stored during warmer months. For overwintering succulents indoors, the ultimate plant-shelf unit is made of lightweight, powder-coated aluminum. It has adjustable lights with energy-efficient, full-spectrum bulbs; plastic drip trays; and wheels for easy positioning. Three shelves provide 18 square feet of growing space. From Gardener’s Supply Co.; about $600. You'll also need a timer that automatically turns lights on and off to simulate daylight. This has multiple outlets: Titan Apollo 14, about $26. Kitchen tongs (around $6) are handy for grasping and potting-up cacti and small agaves with sharp tips, and for twisting pads off opuntias. I wouldn't be without a chopstick to settle roots of succulents. It's essential when small nursery plants are tucked together so tightly, I'm not able to manipulate their root balls to settle them. An old metal teaspoon (mine was mangled by a garbage disposal) is perfect for funneling topdressing into gaps between plants. You can also use a real funnel, but anything larger than coarse sand may clog it. A soft artist's brush is great for cleaning dirt off leaves and spines, and the pointed end of the handle can be used like a chopstick to settle roots. Duct tape wrapped around the fingers of gloves lets you pick up small cacti without getting poked. Please note: Many of these links go to Amazon because their prices are as good as any, and as an affiliate, I receive a small percentage of any sales that originate on my website. I'm grateful if you obtain items that way, but many are readily available at brick-and-mortar stores as well.